The following article discusses a growing trend in the world today known as biohacking, which is a euphemism for transhumanism. Inverse news outlet featured the case of Elizabeth Parrish, CEO of BioViva, a biotech company focused on reversing the aging process. The technique employs a method of slowing down the shortening of telomeres. Telomeres are nucleotides at the ends of chromosomes thought to protect our genes from deterioration. Contemporary views claim that the shortening of telomeres causes the aging process. And by all accounts, this appears to be the case, but the greater cause of aging, or poor health, is much more than just biological. Although modern science is only beginning to understand how consciousness is the foundation physical of health, behind closed doors and within ancient traditions, it is a well-acknowledged fact. Reversing biological entropy is a function of mental activity and resulting emotional expression, which is of course supported by proper diet and exercise. This can be accomplished by artificial means, such as gene therapy, scalar field emersion from orgone generators, and the ingestion of monoatomic elements. But all these things mimic naturally occurring processes. For example, ORMUS or Orbitally Rearranged Monoatomic Elements form naturally in volcanos and are activated by fungi, which are then absorbed into plants. Coherent electromagnetic fields can even produce ORMUS within the body itself, generated by beneficial states of being. And as researchers such as Bruce Lipton have demonstrated, emotional states can and do affect biology, altering gene expression, known as epi-genetics. Stress causes further degradation of biological processes whereas holistic states of mind, body, and emotional coherence revitalize the body. Vital Energy, known as Chi or Prana within Eastern traditions, has long been acknowledged as the source of life within all organisms and the universe at large. Practitioners who are able to properly train their minds via physical and mental techniques can tap directly into this energy, enabling them to stop consuming food entirely. Clearly, if one does not need consume food—an impossibility within the medical establishment—the body must be nourished by more than just chemical compounds from food. In other words, the body is using food to draw in vital energy, but this energy can be collected directly from the cosmos—without having to consume food. The common thread seems to be consciousness itself, but more to the point, how we organize our consciousness. The beliefs, wordviews and ideals we maintain directly impact how emotions are generated, which have biochemical and electromagnetic components. Emotional dynamics radiate our state of consciousness as an EM field or chemical bath, enshrouding the body in either coherent (organized) energy or dissonant (chaotic) energy. The more powerfully our thoughts, emotions, and actions are in harmony, the more vitalized we feel, and the healthier the body will be. Probably the most obvious example of this is the Placebo Effect. The body can be profoundly healed if one believes that it can be. But its little-known sibling, the Nocebo Effect, can do the reverse, again on the basis that one does not believe it is possible. Given all this, it's clear that the causes of aging are far beyond what established science claims. The truth is, our consciousness and what we do with it, is the key principle to understand. And since the mind is the gateway of all our decision-making power, becoming the master of our own consciousness is vitally important—pun intended. So what beliefs do you have? Are you a biological machine or a being of consciousness having a physical experience? Society, especially in the so-called first world, has a rather myopic view of life. It says we are nothing more than random evolutionary accidents, the product of eons of chance. Within this viewpoint, consciousness is nothing more than a byproduct of biology (materialism), but given what was discussed above, does this seem accurate? It seems more likely, based on the available evidence, that consciousness is prime and biology is an effect generated by it. The transhumanist agenda is centrally focused on the aforementioned false belief of materialism. People today are conditioned to think that what they do and how they emotional feel plays almost no role in health and that our genes determine everything, so why bother learning about health or changing ourselves. Given that psychiatric drug consumption has skyrocketed within the past decade, and human health has degraded so widely in the US, this viewpoint is decidedly short sighted. If we simply acknowledged the greater realities of our relationship to the universe, wherein consciousness is the foundation for all things, then the idea of biohacking seems quite foolish, even insane. It's similar to taking a perfectly good house and reducing it to ashes just because the lights stopped working. Why not fix the damn lights instead of tearing the whole house down? The following article details the transhumanist ideology of our fellow humans that have lost touch with reality, and as such, turn to technology to solve their shortcomings. But the cost of abandoning the treasures of our own house, while we seek for treasures outside of us, is incalculable. Oh, you who wish to probe the arcanes of nature, if you do not find within yourself that which you seek, neither shall you be able to find it outside. If you ignore the excellencies of your own house, how do you intend to find other excellencies? Oh, man, know thyself and thou shall know the Universe and the Gods!" — Phrase inscribed in the ancient Temple of Delphi. If you are unhealthy, become wise. If you are not balanced, then seek for it. If you are whole of mind, body and spirit, disease will not touch you. But if you forsake the simple and effective methods of health for external pleasures, do not seek for solutions outside of yourself, for they will only lead to more hardship. For in the process of making yourself whole with artificial things, you loose connection to the source of all life, you loose touch with consciousness itself. A little self-reflection, especially when it comes to being healthy, goes a long way to generating causes that have the effects we desire. In the end, the solution to all our problems, whether health related or otherwise, starts by becoming a master of our own house. It is the long and empowering road of self-mastery and true sovereignty, founded on the belief that changing oneself is the first step to all outward change. Note: There are many valid health points brought up below, but the solution offered, transhumanism, is not realistic. The problem isn't technology per say, the problem is refusing to look at the true causes of poor health, and incorporating consciousness as a factor. Clearly providing health for all people everywhere is an admirable goal, but transhumanist philosophies are reactionary, instead of preventative. 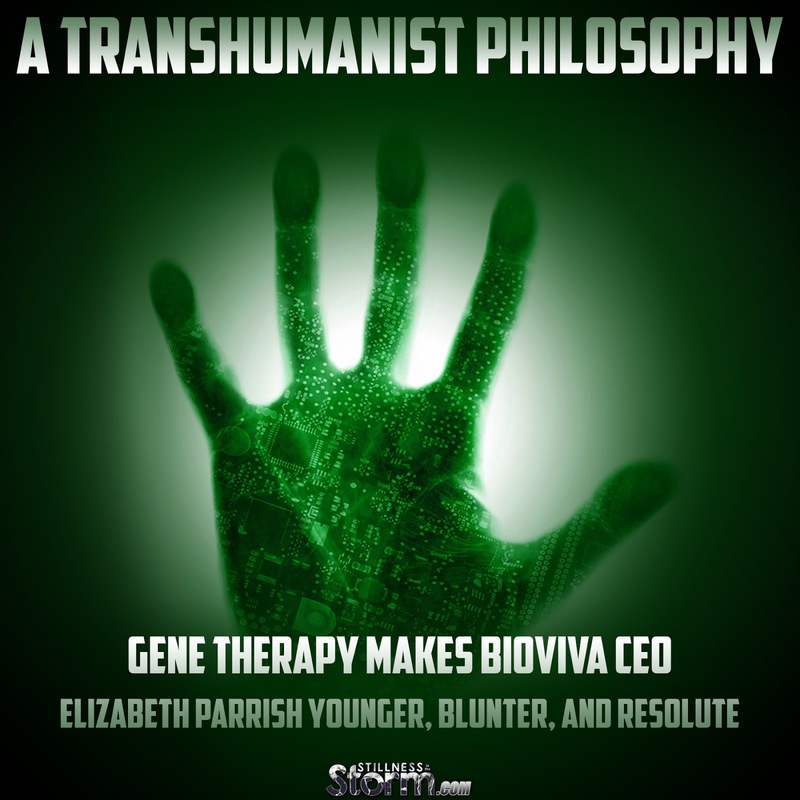 Elizabeth Parrish, Chief Executive Officer and guinea pig for Bioviva, announced today that she has become the first human “successfully rejuvenated by gene therapy.” Using two proprietary processes, Parrish claims to have reversed two decades worth of telomere shortening, the process that leads to the breakdown of cell replications in the vast majority of living things. Telomere scores — measured using white blood cells — indicate that Parrish, who was 44 years old in September, has slowed a cellular process many scientists believe to be one of the root causes of aging. That makes today a big day for Elizabeth Parrish. She’s publicly announcing a potential cure to the disease she feared would kill her: Time. Parrish has become one of the leading lights of the biohacking movement by refusing to see aging as a fundamental fact of life. She described her highly experimental gene and cellular therapies as treatment targeted against an epidemic sometimes called the “silver tsunami.” She has made it very clear that, to her, “old” is a diagnosis. What she hasn’t always made clear — and seems to actively avoid addressing — are the moral, societal, and even medical ramifications of her work. Also the science. Earlier this week, she spoke to Inverse about becoming her own patient zero, how human cells are like computers, and why she’s justified in evading the FDA. "It will become so obvious why we haven't been able to "cure" the diseases of aging -- because we've been treating symptoms for so long," Parrish told Inverse. What made you realize that aging was a disease and not a normal process? I had actually gotten involved to cure childhood disease, so I wasn’t exactly entirely prepared to find out that biological aging was in fact a disease. I went to a very crucial conference that changed my mind: I ended up at the SENS (Strategies for Engineered Negligible Senescence) conference in Cambridge, U.K., and I became very interested in this idea that perhaps biological aging itself was a disease. I took the time to speak with many researchers after that and found out that some of the drivers of childhood disease were in fact accelerated aging. That’s certainly a shift in the way we think about aging. I basically had to change my thinking to realize that the body’s cells are very much like a computer, and the things that they’re programmed to do eventually land up with a lot of damage over time. Some people get that damage at a youthful age; that is, some people have programming issues — genetic problems — early on. Some people are born with them. But all of us are accumulating this damage that will eventually lead to the symptoms of the aging disease and kill us. Framed that way, it seems like a much more daunting problem than dealing with the diseases we already know about. The problem, I thought, would be much easier to solve: It was actually everyone’s problem. It wasn’t an orphan disease, it wasn’t a small subset of children. It’s actually everyone who has the disease. It’s inherent to our very selves. At that point I was really mobilized. In a sense, it was a bigger problem, but it seemed easier to solve. How do you plan to study the disease of aging? I thought that one of the most important things that we needed to do was to start collecting human data. It seemed to be what we were lacking; we were sitting on all sorts of mouse data for a slew of diseases that actually looked really good. I think we’ve cured cancer a hundred times in mice. We’ve reversed atherosclerotic plaques. We’ve reversed biological aging with telomerase inducers. We just weren’t using it in humans. So in order to get the safety data, I decided I would get behind them. I would prove that they were safe by taking them. Last year, you went to Colombia to undergo the first round of your BioViva gene therapy treatment. That was a huge risk. But living is very risky, and you’re guaranteed to die of these diseases. If we can start using these methods in end-stage patients — patients for compassionate care scenarios — and start getting good results, we can move them back into patients who are not in such critical shape, then we can move them back to preventative medicine, and then we really have something. We’ll have cost-saving measures, we’ll be actually saving lives before people get sick. Me, I’m feeling great, and we’ll be releasing some data on that sooner than later. Why do you think there have been so many obstacles to human testing for anti-aging gene therapy? The obstacles are in the regulatory framework. At this point, it’s not really starting a fight to say that the U.S. FDA and other countries have stifled innovation. That’s just obvious. It’s too much paperwork, it’s too far-reaching, the costs to get through the U.S. FDA are too high. And there’s no reason, at this point, that we have to mix safety and efficacy with a price tag of over $1 billion. Those two don’t need to go together. We need to find out how to efficiently get therapeutics through to the public that may be life saving. That’s not going to happen until you convince the FDA that aging is actually a disease. Here at home, we just cannot move quickly enough for patients. We’re losing over 100,000 people a day to biological aging. We’re not really treating this like the catastrophe that it is. Ebola came up and killed many people. It’s a big tragedy. But it didn’t kill anywhere near the number of people that die every month of biological aging. As a matter of fact, if you start to look at that and extrapolate the numbers, millions of people are dying in a matter of months. We just think of this process as being very normal, but it’s actually a very costly process. It’s going to hinder our future significantly. The silver tsunami has already hit the industrialized countries and it’s about to hit the whole Earth. How will you convince the FDA that investing in it now is a better idea than paying for it later? On the Earth, by 2020, there will be more people over 65 than under 5 years of age. So the 5-year-olds become 5, then 25, then 35 — they become the workforce — while the 65-year-olds are retired and are in imminent danger of 20, 30, 40 years of needed accelerated healthcare. So it really doesn’t work. We’re actually at a point where it’s not just fashionable. It’s not a vanity issue. It’s “How do we save economies?” How do we keep people working longer? How do we save the trillions of dollars that we spend every four years on major diseases [which have led to] no cures? The government — your employer — you — everyone saves so much money by mitigating these diseases that there is no reason to hold this type of technology back. If this actually happens; is everyone going to have equal access to these types of therapies? Yeah, absolutely. It’s going to happen very similar to computers or cell phones. At first the technology is very expensive, because it’s new. First it’s kind of like building a supercomputer, and then eventually everyone gets an iPhone. In your life when you look at that, you don’t ever remember living without an iPhone. Certainly you like an iPhone better than you would have liked it if you had to pay for the first supercomputer because your iPhone is much more predictable than the supercomputer was. But it’s that model, and we will get there as quickly as we can to drive down the costs so that everyone does have access to it. Are we going to have to shift the retirement age? What’s the limit here? I don’t really get into those kinds of questions. My job is to mitigate the diseases we can mitigate. To create the mandate on the Earth that the minute we do that, we have to move forward. If we think we have something, it would be immoral not to move forward with it. How long people can live, I don’t know, but I want them to live as well and as healthy as they can live for as long as possible. That’s good for society, that’s good for the economy, that’s good for you and me, and it’s good for the future of our planet. Won’t you run into a problem finding people willing to take part in your studies, if they’re so experimental? We have no end of volunteers, both healthy and sick. As a reminder, as far as the FDA’s concerned, in the past 50 years they have passed, through their gold standard, 50 drugs that have been pulled from the market. Some of those drugs were actually harmful, if not fatal, to patients. We cannot pretend that their standard has kept anyone safe. It was there initially to keep people safe. It’s not actually doing a good job of that. It definitely serves a purpose, where we want drugs with safety and efficacy, we want to keep the public safe, but not to the point where they’re dying, waiting for treatment. If you’re letting people die without access to experimental treatments, then your safety and efficacy administration is failing. Yasmin Tayag is a writer and former biologist living in New York City. A Toronto girl at heart, her writing also appears in The Last Magazine and SciArt in America, and you might recognize her as a former host of Scientific American's YouTube series Instant Egghead.